The Dutch network war resources (netwerkoorlogsbronnen) wants to make their collected information on Dutch war memorials and lieu de memoire available through Wikidata. In my beginners Wikidata point of view that would involve adding new WD items for the places that don't have an ID yet, and adding properties for war memorial to existing places. Please see the attached file (in Dutch) to get an idea of the data involved. Any help on getting this info on Wikidata or first steps on how to go about this are much appreciated! Pintoch added a subscriber: Pintoch. I would be interested in helping with this - I can guide you through the uploading process with OpenRefine. The videos at http://openrefine.org/ are also useful to get an idea of what OpenRefine does (with no reference to Wikidata). Fedfant removed a subscriber: Fedfant. We are willing to help out with this. Is anyone working on this yet? Proposal: We want to start with a pilot project: uploading all Aalten monuments (15 items). Check how many are already in Wikidata. Manually upload 3 items to get a feel of the required properties. Reorder data in Excel to easier allign columns and Wikidata Properties. Make selection of collumns for Wikidata. Find us in the hacking room! We made an export of all Dutch war memorials in Wikidata and compared them with our list (Monumenten - Gelderland). 37 memorials already have a page. A demo would be great. It's just me (Fricke), so far, but I'm expecting three team mates. We will also have to convert some GPS coordinates in bulk. Do you have a tip what tool/site we could use for this? All items were specified as 'an instance of ' war memorial. This could be further specified in the further, with the help of the attached Excel. If we get so much detailed information into Wikidata, we should try to use a Wikidata-driven template to show this information on Wikipedia. 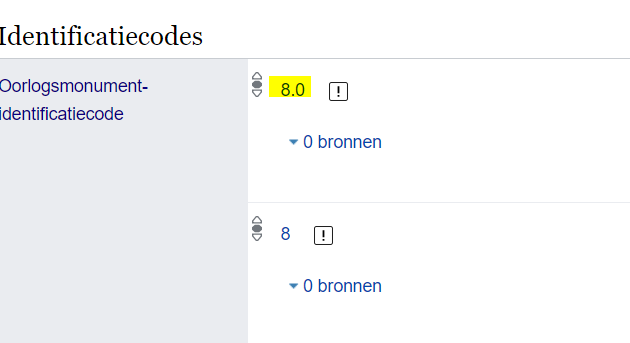 Will we use a special template for this, or update the template [https://nl.wikipedia.org/wiki/Sjabloon:Infobox_beeld]? Not all monuments are sculptures. Should we make a subtask or a separate task for this? The spreadsheet which Slryn made available has also a description of each monument. If this information is available under the right license, we could use this spreadsheet to create pages for monuments and use the infobox and these descriptions to start with articles on a reasonable level. Some script to use a csv to create these pages and fill them was already made yesterday. I'll upload it to github. We were planning to upload the whole list in one go, but it required to much manual checking. I ended up adding a first batch of 100 items (see attachment). Edit: There is still one issue: OpenRefine interpreted the identifier as an integer (adding ,0). I tried to correct this by setting the collumn to tekst, but now it is showing the identifier twice. Does anyone know how to solve this? I figured there might already be a script available. Basically there are a lot of items that have no known suggestion. These could be automatically set to 'new item' (Note: this isn't foolproof. For example the Anne Frank house doesn't get a suggestion, if you try to add it as a monument, but of course it's already in Wikidata under a different, and probably more suitable label). A lot of other items do get suggestions for possible Wikidata matches. Since we already did a check in advance these are usually wrong. The monuments we're working with all have an unique identifier, so it might be possible to exclude these false suggestions, but I'm not sure how to go about it. Just to let you know that the problem with the ".0" will be solved in the next version of OpenRefine. In the meantime, you can solve the issue by transforming your column with the following expression: value.toString().replace(".0",""). Hope it helps! I'll get on making this happen. My collegeau told me that they are actually freely licensed, but we do not have the written statement to back it up. It would be great if we could use the descriptions to make articles. I'll let you know how it works out. Would writing a script be the way to go since the problem is not existing in the future? If it is to much work for just 100 uploads, I did be happy to adjust them manually.